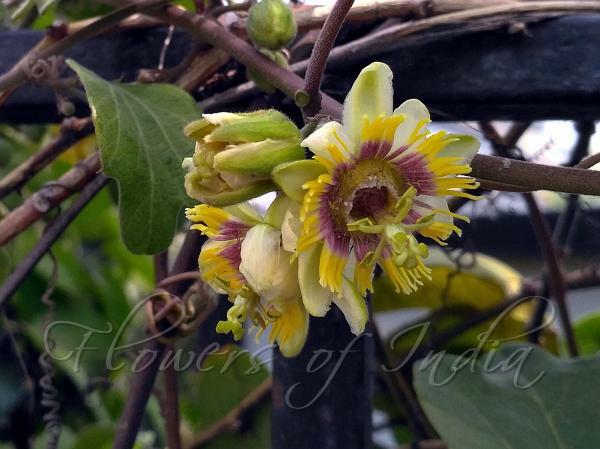 Silky Passion Flower is a climber which blooms with beautiful fragrant white flowers with a yellow and reddish brown heart, all summer long. It is covered with soft hairs all over the plant. The stem is nearly round in cross-section, 6-9 m long. Flower-cluster-stalk is 1-3 cm long, with 2 stipules and glands. Leaves are trilobed, shallowly indented, 4.5-16.5 cm long and 3-14 cm wide. Leaf-stalks stand in pairs, 0.5-3 cm long, with 1-3 flowers each. The bract is oblong, up to 1 cm long. The flower is white with a yellow and dark red to brown corona, 3.5-4.5 cm in diameter. The flowers give off a sweet smell. Fruit is nearly spherical, 1.5-3 cm in diameter. Seeds are 0.5 x 0.3 cm in size. 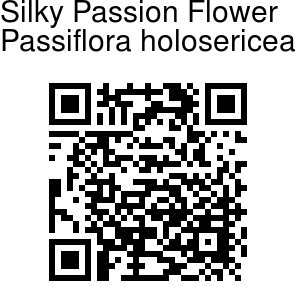 Silky Passion Flower is native to Central and South America, cultivated as a garden plant in India. Identification credit: Maniruddin Dhabak Photographed in Delhi & Thane , Mumbai.